I am an active 42 year old male. I injured my knee 09/02/10 playing softball. The play was at home and the ball was coming. Instead of sliding I planted my leg to jump over the guy. In the process of planting my leg I hyper extended it and twisted the heck out of hit and felt the dreaded 'pop'. I walked it off and tried to keep playing. I moved to first base from the outfield. My knee bent the wrong way a couple of times and I knew something was just not right. The injury surprisingly didn't hurt. It just felt horribly unnatural. It still gives me the chills remembering the feeling of my knee bending the wrong way. About the only exercise I could do over the last 6 months was cycling and weight lifting. I desperately missed competitive softball and helping at my sons baseball practices. For an active father of 5 that was not working for me so I elected to have surgery. I was very concerned about pain management after surgery from reading all the stories on this site and from a former shoulder surgery (labrum repair) I had 10 years ago. (The meds they gave me back then did not work and it was a miserable experience.) I am a wuss when it comes to needles and pain in general. I spoke to the surgeon and anesthesiologist and they recommended a femoral block and some higher dosage pain medication. 03/09/11 - Had surgery. Lasted 2 hours. I woke up at 3pm. 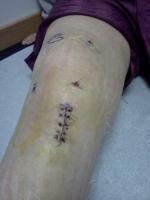 I had an ACL and minor meniscus repair (the kind they only had to trim off and not suture). I opted, via doctor's suggestion, for a donor graft. Got home around 4:30 the same day. Femoral block worked great, did not feel much pain at all. I went right to my bed and propped my leg up on some pillows and put the ice wrap/cuff machine I borrowed on and took my first pain pill. I focused on keeping my leg straight with no support under my knee, especially while the femoral block was working, since it is not the most comfortable position. This extended knee position helped me regain my motion back quicker after I originally injured my knee and from other web sites I have read it helps with rehab after surgery. wife refilled the ice machine once during the night. I kept waiting for a waive of pain to hit (after the femoral block wore off) but it never came. For me day 2 is always the worst after an injury, hard workout or my prior shoulder surgery, so I was very concerned; but it never came! Halelujah! I think lots of ice, staying ahead of the pain with medication (I am using Vicodin - Hydrocodon-Acetaminophen 7.5-325)was the key for me. Everyone reacts differently to pain meds so find one that works for you. I was told not to put any pressure on my leg until 12 hours after surgery due to the femoral block and then after that only as toleraable. I was surprised that I could stand on both legs normally on day 2. I even took a couple of timid steps without crutches. Pain is very manageable. I religiously kept taking my pain meds every 4 hours and lots of the ice machine. I definitely know that my knee has had some serious work done to it, especially when doing my exercises, but I am OK.
Maybe today will be the day of the waive of pain....Nope! Pretty much the same as day 2. I have backed off my pain meds though and am taking them every 6 hours now. The pain meds make me groggy and a bit loopy so I will stop them as soon as I can. The boredom of just lying around is tough on me. My back is sore from it. I am not one to watch a lot of TV or movies so this isn't fun. I know I need to rest my knee though. I took a pain pill before bed and that was it through the night. Kept the ice machine on all night. Better than day 3. I was able to take my bandages off today. Makes me a bit woosy to see the entry points and stitches. Kind of makes it hurt worse to see it too....all mental. I can walk without crutches but still choose to use them just to be safe. I have only taken 2 pain pills today. I am trying to move to Ibuprophen exclusively now. We'll see. So far I think I am going to make it. My wife says we have gone through 6 large bags of ice. I appreciated reading others experiences through knee surgery and hence decided to share my experience and will keep doing so. You can do it!